So we know that Forest City Realty Trust (FCRT) and Greenland USA will restructure their 2014 joint venture to build Pacific Park, with Greenland taking all but 5% of Forest City's 30% share going forward. And that Forest City New York CEO MaryAnne Gilmartin is starting a new firm with some key colleagues. A key detail didn't surface until January 17: the deal has been cooking for a year, said Marion Phillips III, an executive at Empire State Development (ESD), the state authority overseeing/shepherding the project, speaking at a meeting of the Atlantic Yards Community Development Corporation (AY CDC). That suggests that Gilmartin, aware that Forest City was pulling back on new development and this troubled, signature project, had time to formulate an exit, and bring a service contract to manage Forest City's Pacific Park stake to her new firm, L&L MAG. Despite a promise to restart construction and a striking new image of the project portrayed in full buildout, Pacific Park emerges with some significant question marks: notably, the timetable for the whole project, with only four of 15 towers completed beyond the Barclays Center, remains unclear. And if the affordable housing will meet the 2025 deadline, its location, as well as the level of affordability, remains in question. Image from L&L MAG adapted with pink arrows pointing to finished buildings. Green arrow at left Site 5, at right B4. Phillips' statement also puts an odd light on a prediction made last June by Hu Gang, the CEO of Greenland USA; that the joint venture likely would start two buildings in 2017. Not only did that not happen--did he expect a faster restructuring? why didn’t Greenland buy out Forest City’s share of specific parcels?--Greenland is not yet pursuing two previously designed buildings, which might presumably launch soon (albeit no longer as 100% market-rate towers), but rather will start lengthy design work on a giant tower. It will be the first tower to start since June 2015. The financial terms of the restructuring won't be revealed until the deal closes later this year. If past patterns continue, parent Forest City Realty Trust will announce an "impairment," or accounting loss. The next building, known as B4, would hug the northeast flank of Barclays, at Atlantic and Sixth avenues, and is expeced to rise 511 feet and contain some 825,000 square feet, enough for at least 750 apartments. According to tentative plans circulated in 2014, that tower would contain 551 rental units, half of them affordable, plus 213 condos. In 2016, Greenland Forest City floated plans to build B4 as an office tower, which would've required a likely year-long process to change the governing project plan. Now, the joint venture aims at residential space. 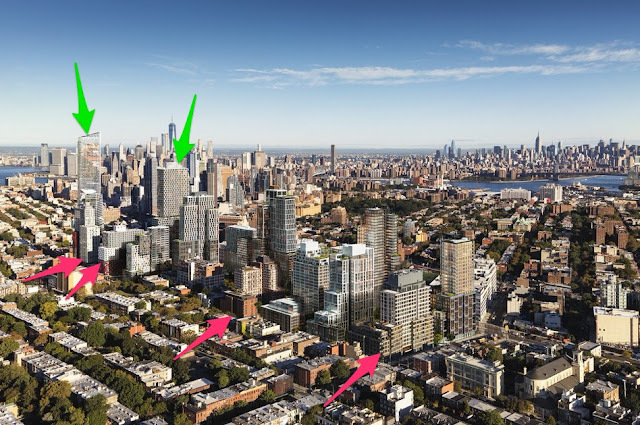 Greenland USA project manager Scott Solish, speaking Wednesday at a meeting of the Atlantic Yards Community Development Corporation, which advises ESD, could not specify the building's unit mix. But it's a good bet it will contain a significant chunk of below-market units, given the 2025 deadline. Solish did say they aim to break ground "hopefully" in the late second quarter of 2019. However, if that timeline stretches, plus B4's once-projected 27-month construction timetable, it might not open until 2022. Representatives of ESD and the joint venture reiterated their commitment to the 2025 deadline for 2,250 units of affordable housing, of which about 780 have been built. To meet that deadline, and avoid onerous fines, the apartments may have to be concentrated in the next few buildings, rather than spread among long-promised "50/50" buildings mixing market-rate and below-market units. The possibility that three remaining parcels on the project site below Pacific Street--above it is the railyard, where six building sites await a deck for future construction--might concentrate the affordable housing concerned Barika Williams, a member of the AY CDC board. "We could have affordable pockets and non-affordable" ones, said Williams, a housing advocate. 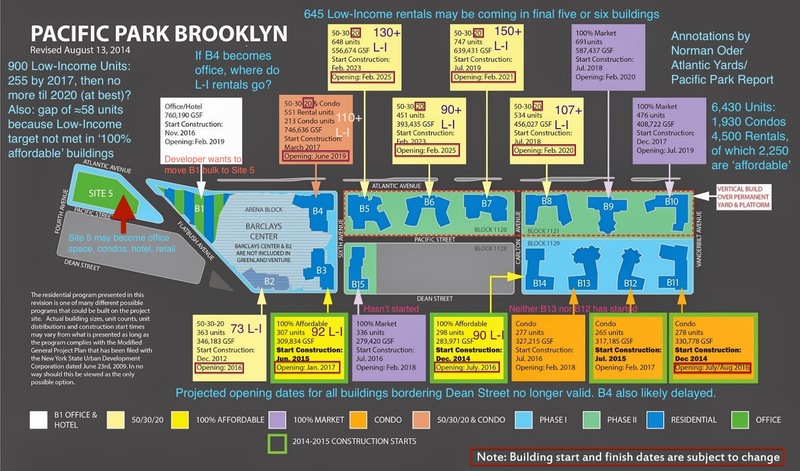 She asked if a 2014 map (below) that detailed the project's potential buildout and configuration--now drastically stale, since buildings are delayed--could be updated, explaining the status of the project, including the planned school. Tentative plans as of 2014 for a buildout by 2025; nearly everything is/was behind schedule. The tower (B15, aka 664 Pacific) with a planned middle school, once projected as opening in 2018, has not started and would take at least two years to build. Officials offered no timeline, but unless it starts by this summer, the school wouldn’t open until the 2021-22 school year. Solish said they hoped to produce a new map later this year. Indeed, project managers have had to scramble. When the state's 421-a tax break was revised last year, no longer allowing market-rate buildings in Pacific Park to qualify as long as the overall project met an affordability threshold, "it did away with that map," Solish said. That means fewer condos, if any, in the project beyond the completed 550 Vanderbilt tower and no 100% market-rate rental buildings. So previous plans for two condo buildings and two market-rate rental towers--among the two previously designed buildings (B12, B15)--likely must be revised to include affordable units. That raises the tantalizing possibility that Pacific Park might even contain more affordable units than required, if post-2025 buildings, to get the tax break, must include them. Or maybe the developer would lobby for an exception. The range of affordability remains in question, as well. While Forest City and housing group ACORN agreed in 2005 on a program that mixed low-income, moderate-income, and middle-income below-market housing, two recent "100% affordable" buildings have been skewed toward better-off households. Representatives of the developers and the state said the project’s guiding documents remain essentially unchanged. "We look forward to them moving forward, we think it’ll be a great relationship," said Phillips. When might the full project be finished? 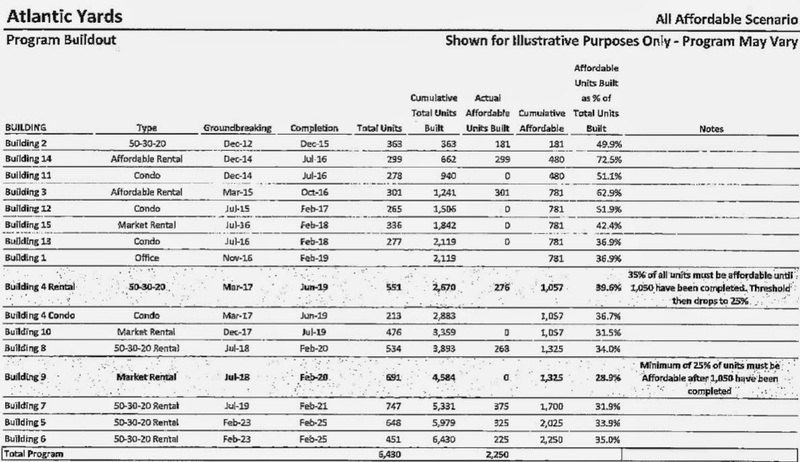 The developers, in a June 2015 prospectus (see 7th page) to 550 Vanderbilt condo buyers, pointed to a 2025 completion date but included a caveat: the timetable "may be subject to circumstances beyond Sponsor's control." Last August, when The Real Deal asked, Is Pacific Park in trouble again?," former city official Seth Pinsky, now at RXR Realty, expressed doubt about 2025, suggesting such projects must endure market cycles. Gilmartin, who'd claimed to The Real Deal that the partnership was fine, this week told Crain's New York Business the contract aimed to get the project "built as expeditiously as possible,” which leaves significant wiggle room. Forest City Realty Trust, after announcing in November 2016 that it would pause new Pacific Park construction, said its financial model extended to 2035, which implied project completion not many years before then. The project developer in June 2016 began 15 equal installments of approximately $11 million to pay for development rights on those six railyard parcels--a process that could last through 2030. Timetable predictions for Atlantic Yards have proven treacherous. When the Forest City announced the project in 2003, it was expected to take ten years, a timetable affirmed when Empire State Development approved it in 2006. After the project was revised in 2009, the state allowed a 2035 "outside date" for final buildout, one that was revised--for the affordable units, at least—to 2025 after the Greenland joint venture was approved in 2014. For now, though, it looks like the removal of blight—building over the railyard—and providing the promised eight acres of open space will take well past 2025. Phillips noted that elected officials were briefed a year ago about the potential project change. That—including the assurances of the affordable housing timetable--perhaps explains the lack of public pushback. He had some good news: two sites on the project's southeast block, in between the completed 535 Carlton and 550 Vanderbilt, will become temporary open space as plans percolate. But a few community members who've monitored the project attended the meeting and expressed dismay about oversight. "It is likely that transparency and accountability will be further diminished," said resident Steve Ettlinger, given that the primary owner is a foreign company that "is opaque and has rarely made itself available for substantive questioning." The government of Shanghai--Greenland's largest shareholder--"could have more say about this than New York's own government," said Ettlinger, representing the Barclays Center Impact Zone Alliance. Peter Krashes of the Dean Street Block Association suggested that the required environmental review was out of sync with the reality of a long-lingering project, one initially approved in 2006 and expected to be finished in 2016. He noted that former Deputy Mayor Dan Doctoroff, in his memoir, said he thought the project was a "crazy risk," the "environmental review assumed a ten-year construction timeline," which turned out to be way off. 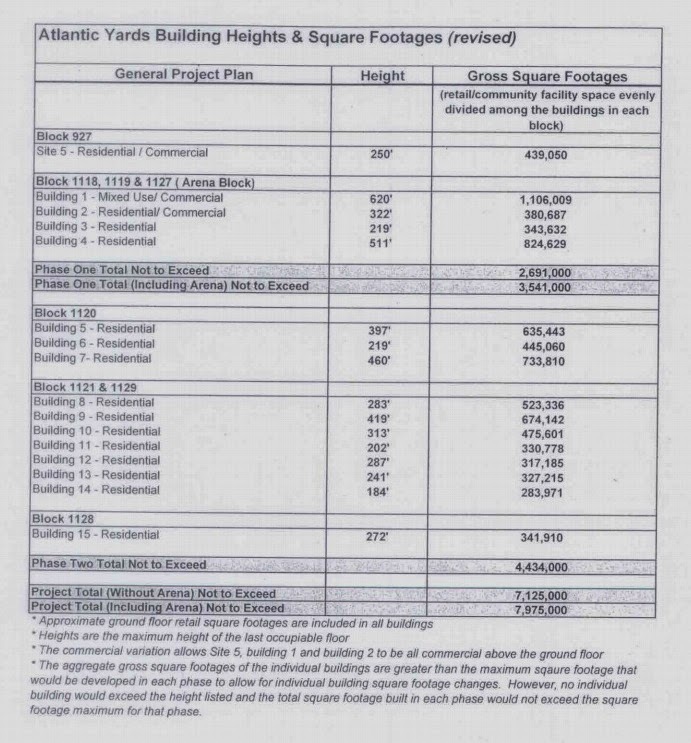 Jaime Stein, a departing member of the Atlantic Yards Community Development Corporation, suggested that the body could do more outreach to the public and elected officials before the next major project change, expected to be a giant two-tower plan at Site 5, currently home to Modell's and P.C. Richard, catercorner to the arena. That project, slated for office space, requires the state to approve a shift in bulk from the unbuilt tower over the arena plaza, but has been delayed by a court case. Phillips offered an olive branch regarding Stein’s proposal: "I think there are some very good ideas related to community engagement."